By far the most frequently killed creatures in Mount Revelstoke and Glacier National Parks are seed-eating birds, mostly Pine Siskins and Crossbills. The largest flocks on the road are Pine Siskins, small brown birds with a bit of yellow on their wings. When present, siskins frequent the lower valleys of the interior wet belt and are often encountered on the roads between Sicamous and Golden, Mica Creek and Nelson. Attracted to grit spread on the Trans Canada Highway to provide better traction in slippery weather, these birds are frequently clobbered by passing vehicles whose drivers, apparently, are unaware of their existence. 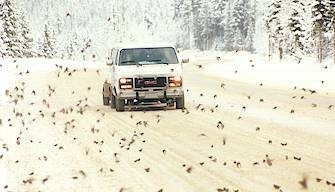 It‘s not unusual to see hundreds of dead birds on the road on a drive though Rogers Pass. In snowy weather they are soon flung from the road by speed ploughs; otherwise, Ravens clean them up. Recently, I watched a Raven pick up dead birds from the road, making repeated trips to the forest to stash them for later consumption. A Steller’s Jay carried one away, too. Birds don’t have teeth. Grit and gizzards perform the function of chewing food before it goes to the stomach. A ploughed and sanded highway is the easiest place for them to find the bits of grit they require to help them digest conifer seeds. Christmas Bird Counts often show Pine Siskins as the most numerous bird in our area, but some years they are completely absent. True nomads, these birds follow no known migration pattern. They wander unpredictably across southern and central Canada, southern Alaska, the western United States, the Mexican Highlands, and as far south as Guatemala, seeking the most abundant cone crops. Conifer cones are especially plentiful and reliable in old growth stands like those found in and around our parks. The seeds are rich in calories, an obvious necessity for surviving winter. Pine Siskins are generalists in that they can feed on the seeds of hemlock, cedars, alders and birch. Crossbillls specialize to a great degree, usually feeding on a single type of tree. So many little corpses does provide an opportunity for recovering bird bands. Siskins from New York, New Jersey, South Dakota and Oregon have been recovered locally. Should you happen upon a banded bird of any kind, please report the band number to the Canadian Wildlife Service at 1-800-327-BAND. You will receive some interesting bird information in return. Some of the birds we see on the highway may have ingested toxic amounts of road salt. 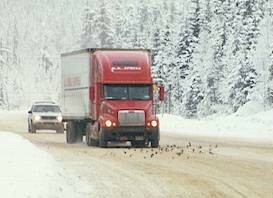 Dr. Pierre Mineau of the Canadian Wildlife Service in Ottawa has conducted laboratory trials that suggest small birds could ingest enough road salt to slow their awareness and reaction time. Drivers can make a difference in the number of birds killed. Watch the roads carefully, especially after a snowfall, as these flocks can resemble dirty clumps of snow. When you see a flock on the road ahead, don’t count on them flying off in time to avoid a collision. Start honking at them from a distance. You may have to honk more than once to get them to abandon their fatal attraction.